Mark Allen Shepherd’s story is one of Star Trek’s coolest, quirkiest and most unusual tales. 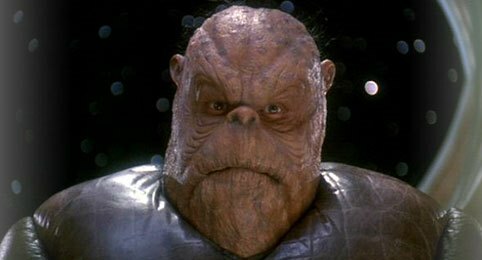 For the entire seven-year run of Star Trek: Deep Space Nine, Shepherd played Morn, the alien barfly who frequented Quark’s, apparently was the life of the party, but never uttered a word – at least not on camera. Beyond portraying Morn, who was a Lurian, Shepherd appeared on DS9 as a Starfleet civilian and even as a Bajoran asked to sit in Morn’s usual spot at Quark’s after Morn’s supposed death. Shepherd also made cameos as Morn on Voyager and The Next Generation. And Shepherd’s contributions to Star Trek didn’t end there. Also a talented artist, Shepherd licensed two dozen pieces of his artwork to the DS9 production team, pieces which were used to decorate the quarters of several major characters, including Major Kira and Dr. Bashir. StarTrek.com recently caught up with Shepherd, who now lives in Germany, for an exclusive two-part interview in which he recounted his days on DS9 and filled us in on what he’s doing now. Below is part one of our conversation, and be on the lookout tomorrow for part two. Give us a quick sense of what your life was like before DS9? Shepherd: I graduated from Roger Williams University with a Bachelor of Science degree and then studied music, video, motion graphics, editing, Tái chi chuan and theater at CalArts, a dream school started by Walt Disney. After that, I was looking for a job and basically took whatever I could get at the time to support myself. I worked as a photographer’s assistant G5 at the local V.A. medical center. I was doing some production work and took any acting jobs I could find. In March of 1992, I was working on a David Lynch project called On the Air. It was based on live television of the 50´s and 60´s. I worked on it in March, I guess, for about six weeks or so. It premiered in July. It showed three episodes and then On the Air was off the air. I thought it was funny, but unfortunately it didn’t fly with the networks. You soon after went in and won the role of Morn on DS9. What did the producers tell you about the character in advance? Did they say it was a one-off or recurring? Shepherd: Not a word. OK, maybe sometimes. Usually, I was the last person to find out anything. And it always seemed to be an “Oh, by the way, you’re doing such and such in the next scene. Can you do that?” And I´d always reply, “Sure, I can do anything you want.” I think that they always had in the back of their minds that if I worked out that they would continue to use the character. Working in a full makeup like that for 12 hours is challenging for anyone, but finding someone to work for seven years in that kind of outfit with makeup is difficult. Most actors don´t want to do it. Did they tell you you’d have no dialogue? In the book The Making of Star Trek: Deep Space Nine, the first chapter of the book is “The Funniest Joke in the Universe” and it is about exactly that and how I came to be on the show. That was the only time I got to say anything while the cameras were rolling, but it´s not the only time that they considered Morn for a speaking part. There have been numerous scripts where they originally had Morn speaking. One such script had to do with the alternate universe. Unfortunately, they always got written out. Before the writers filled in details about the character in actual episodes, did you create your own back story for him? Shepherd: I didn’t have any preconceived notions about Morn. The first two years I worked on the show I didn´t have a car, so whenever I worked I always had to take a bus to Hollywood the night before and stay up all night in a Denny’s restaurant or the Insomnia Cafe´ drinking coffee to stay awake. So, when I worked, I didn´t get any sleep. It was all I could do not to fall asleep while I was on the set. There was even an occasion where, in the pilot, after two days with no sleep, a 110-degree heat wave and no air conditioning on set, I started to fall asleep standing up. A group of guys came over to me and, after asking me if I was OK, said that they were taking bets on whether or not I would fall over. Whenever the writers talked to me I was always interested in what they would tell me next. I think mostly I just tried to keep an open mind and have a good sense of humor about the role. Which episodes did you enjoy most, and why? Shepherd: I grew up watching the original Star Trek series. Kirk and Spock were my heroes. So whenever I got a call to come in I was excited to be there. One time I got a call to come in for a fitting for Morn. Now, it wasn´t a fitting for Mark, it was a fitting for Morn. I thought that was funny. So when I came in, they put my makeup on first and then sent me to the wardrobe department. I found a tailor waiting for Morn to fit Morn for a tuxedo. I don´t remember the name of the episode, but it was somehow based on “Our Man Bashir,” where Morn is wearing a tuxedo, comes out of the holosuite and walks down the spiral staircase. Quark is shaking a drink and Morn says “Shaken but not stirred.” Unfortunately, at the last minute it got cut. I think I enjoyed “Who Mourns for Morn” the most, though, and especially when Morn comes back to the bar after faking his death, (and also) the introduction from Odo and the surprise of Quark and his reaction when Morn regurgitates a shot glass worth of liquid latinum and gives it to Quark for his trouble. That was a proud moment for me. Did the writers tell you in advance that they were planning “Who Mourns for Morn” or did they surprise you with that one? What did you discover about the character as a result of that episode? Shepherd: Yes, the writers did, in fact, tell me bits and pieces about an upcoming episode where they said Morn was going to die. I thought my career on DS9 would be over. But every time they spoke to me it changed a little bit. Sometimes I thought they were just joking with me to get a reaction of some sort. And as the time came to see a rough draft of the script, I got a copy. Then I started collecting the changes that they made almost on a daily basis. I think there was even a part where Morn was going to say something, but that, like so many other times, got written out. I was deeply flattered and intrigued by the story. It really gave me an opportunity like no other episode to discover who Morn really was in the eyes of the writers. I learned Morn was a rascal in a nefarious sense who was involved with a group of almost sympathetic thieves that heisted 1000 bricks of gold-pressed latinum. Morn had extracted the liquid latinum from the gold-pressed latinum and kept it in his second stomach. (I also learned that) that Morn had hair almost 10 ten years earlier and that Morn was probably there during the end of the Cardassian occupation. These were all things I never imagined about the character, but things like that give the character depth in a way that sight gags alone never can. The writers had a way of keeping me wondering what they would do next. Coming back at the end of the show was somehow a proud moment. Who came up with the idea of you playing a Bajoran sitting in Morn’s seat? And how much of an out-of-body experience was doing that bit? Shepherd: You know it´s funny, to this day I don´t know whose idea that was. I think it might have been something someone said at a production meeting, like, “Wouldn´t it be funny if Mark Shepherd is the Bajoran sitting in Morn’s seat at the memorial service as an inside gag?” And as I say that I seem to recall that Ira (Behr) might have said that to me on the set. Well, as far as out-of-body experiences go and being a fan of the original show since I was old enough to pick up a phaser, I must say that every time I had a chance to act or just watch and learn, it was a tremendous opportunity for me, which fascinated me to no end. I have a great deal of respect and admiration for the actors and the level of concentration and organization that the production company must on a daily basis achieve to reach such outstanding production values. I would not hesitate for a moment to do something like that again.